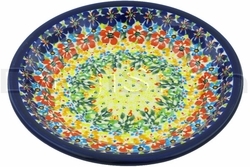 Home > SERVING PIECES > Small Plates 7.7"
Home > PLATES & PLATTERS > Small Plates 7.7"
A beautiful decoration for the dining table, this hand-finished Polish Pottery Plate makes a lovely gift or enhancement to your own Polish pottery collection. Spice up any occasion with this hand-made stoneware plate. From serving desserts to various appetizers, it's a versatile piece.